Playful Learning is pitched at the intersection of learning and play for adults. 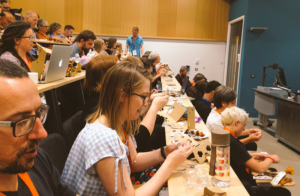 Playful in approach and outlook, yet underpinned by robust research and working practices, the conference provides a space where teachers, researchers and students can play, learn and think together. A space to meet other playful people and be inspired by talks, workshops, activities and events. In its new home at the heart of England at the University of Leicester, we are now opening the programme up to outdoor spaces, where evening activities will continue the playful learning and conversations after the formal programme ends. Playful Learning is chaired by Dr. Alex Moseley, a National Teaching Fellow and Head of Curriculum Enhancement in the Leicester Learning Institute; Professor Nicola Whitton, Director of the Durham Centre for Academic Development & Professor of Education; and Rosie Jones, Director of Library Services at the Open University. It has had three playful and successful years in Manchester, producing two special journal issues and a book; and is now moving to the University of Leicester to provide a new space and new opportunities for creative thinking. The call for sessions is open until February 4th; and registration is currently open at Early Bird rates until March 29th. Our ethos is to break the traditional conference mould, and programme a range of different types of talks and activities, from research paper discussions to live gaming roleplay events. Playful in approach and outlook, yet underpinned by robust research and working practices, we provide a space where teachers, researchers, information professionals and students can play, learn and think together. We are looking for submissions in all areas relating to the use of play or playfulness in adult learning including – but not limited to – higher and further education, playful workplaces, and lifelong learning. This year, we are inviting sessions around the theme of the ethics of playful learning: sustainability, accessibility, and inclusivity. To find out how to submit please visit Playful Learning call for sessions.